Trans-national ethnic Chinese gangs are behind the growing trade in counterfeit anti-malarial drugs in South East Asia, the BBC has been told. John Newton, a senior investigator with Interpol, said counterfeits are now starting to appear in Africa too. He said the gangs involved organised criminals working across national boundaries and faking the drugs on an industrial scale. He described them as businessmen with a sophisticated network of conspirators. In some cases, fake drugs operations are run alongside trade in fake credit cards, weapons and narcotics, he said. The gangs are close-knit and hard to penetrate. "The common denominator is that they are ethnic Chinese," said Mr Newton, a senior investigator and specialist in counterfeiting with the international police force. "By that, what I mean is that they may be Malaysians, they may be from the People's Republic of China or Myanmar, the former Burma. "Because they know each other, they're very difficult to infiltrate. They have established networks in the various countries. They're able to exchange and distribute the product. And that makes it very difficult for us to counter," he said. The fakes are increasingly sophisticated. That, plus the scale of production, suggests a large investment by the criminals. 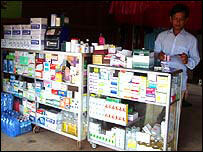 International health officials warn that anti-malarial drugs are just the tip of the iceberg. There is also growing concern about fake antibiotics and fake anti-retrovirals used to treat HIV/Aids, and even fake versions of the drugs used to treat avian flu. The UN said that within a few years, global sales of fake drugs could be worth $75bn a year.